Today I was supposed to try the waterfall braid, but from the photo you can see that I didn't. A few things stopped me. Firstly my hair is quite oily and having it down just looked terrible. Secondly I didn't want to just a style for a photo and then put it up. It is supposed to be the hair I have all day. Sydney is horrible at the moment. It is so wet and humid, so I knew I didn't want my hair down today. 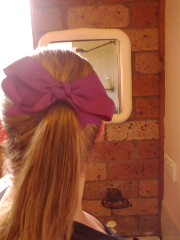 Also I worked out today and it was easier to do a ponytail and add a bow for some extra girlishness and colour against my black workout clothes. Tomorrow I will either do the waterfall braid or maybe beachy hair since it is Australia day.